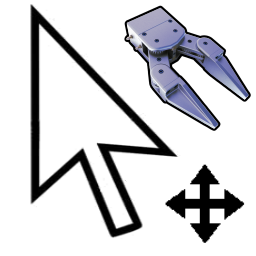 The RoboDK API documentation is available here. 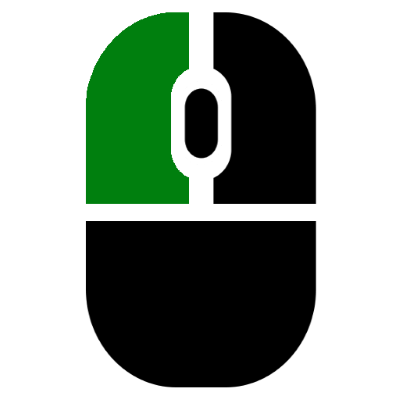 Some examples that use the Python API are available here. Reference frames allow placing objects with respect to each other. Drag & drop any reference frame or object in the Station Tree to create nested reference frames. 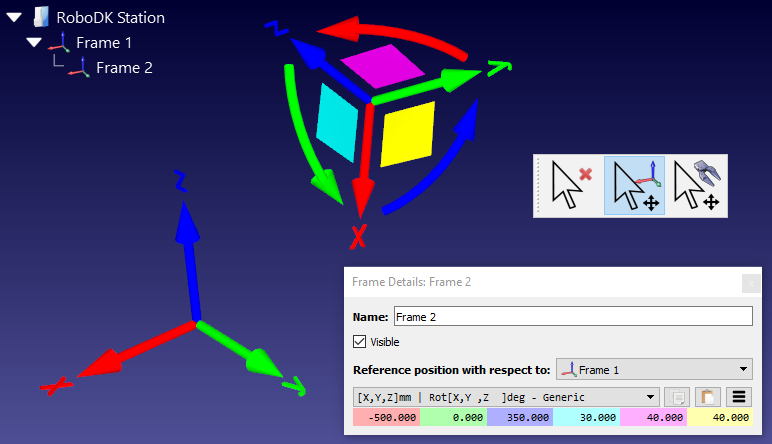 Hold the Alt key to move Reference Frames by selecting them on the 3D view. 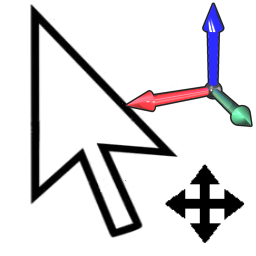 It is also possible to manually enter the translation and rotation values specific to any robot, including quaternion values and different types of Euler rotations. Select the preferred Euler orientation in the menu: Tools-Options-General-Default Euler Angles mode. Select the buttons on the right to copy/paste the values from/to an array of values or as a 4x4 pose. Activate collision checking. Items in a collision state will be displayed in red. 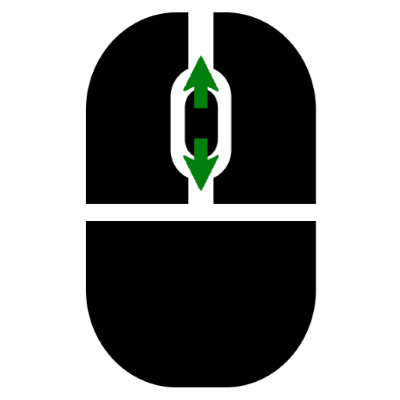 Double click a robot to open the robot panel and jog the robot axis by axis or in the Cartesian space. 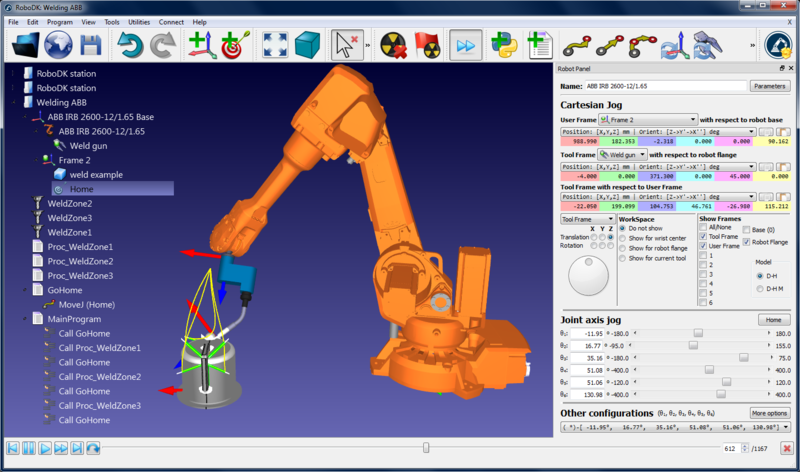 The robot tool (TCP) and Reference frames can be modified in this window. Double click a program to view the simulation. 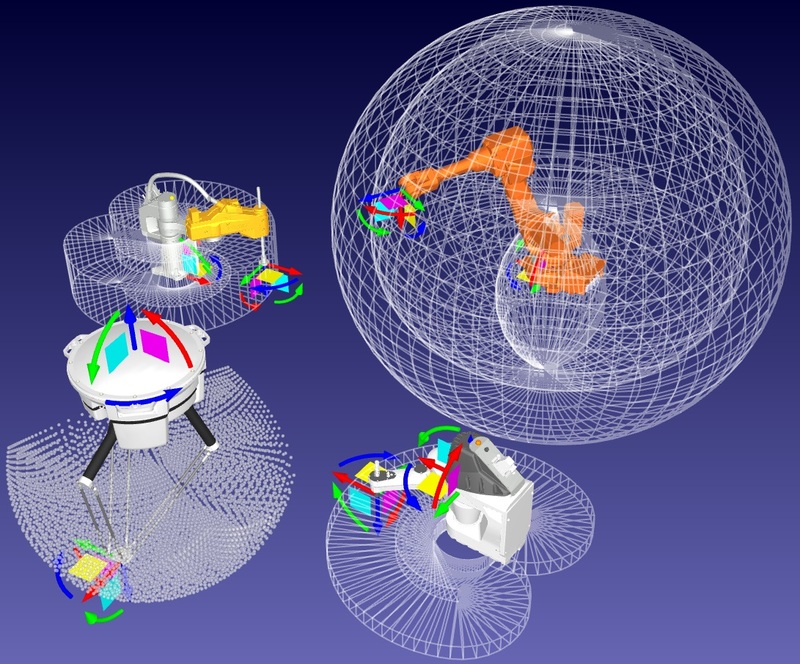 Robot tools can be easily created by importing a 3D object and drag & dropping it to the robot. 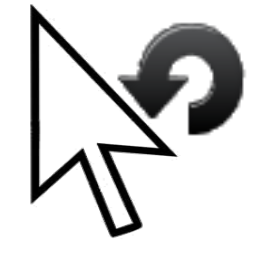 The object is then automatically converted into a tool. Import 3D objects to model the cell. Accepted 3D formats include STL, IGES and STEP files. 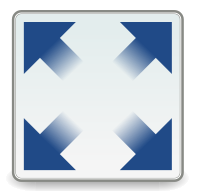 Once a simulation is ready, export it as a 3D HTML simulation or as a 3D PDF. 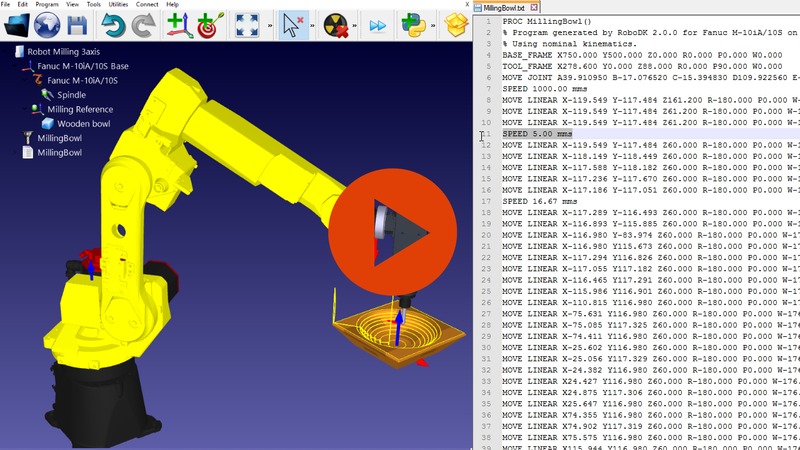 This feature allows to easily sharing layout and simulation concepts. 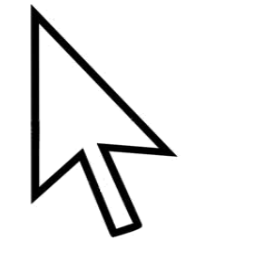 Tip: HTML simulations are larger than PDF simulations, compressing them will considerably reduce their size. The HTML simulation does not have any dependencies and can be shared as one single file. 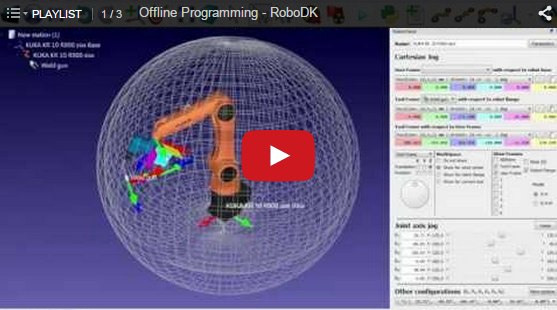 The robot Post Processor defines how the robot programs should be generated. The conversion of the simulator movements to specific robot instructions is done by a Post Processor. Post Processors provide complete flexibility to generate the robot programs for specific requirements. 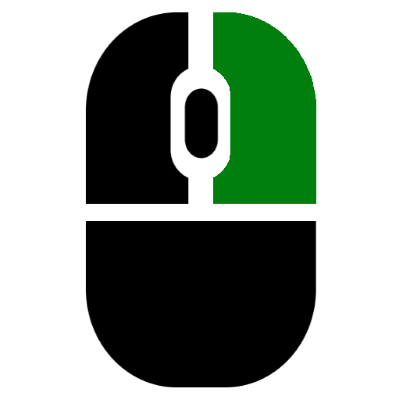 RoboDK provides Post Processors for most robot brands. Post Processors can be easily created or modified. One Post Processor in RoboDK is simply a Python file that defines how the code should be generated. Each robot brand uses a default post processor that can be modified to customize program generation and better adjust to specific applications. Tip: Double click a post processor to see a preview of a sample robot program.